Snacking at work can sometimes be a distraction to get us through the day, and also part of what creates community among co-workers. You might share a celebratory cake for birthdays, or indulge in communal meals for holidays or other exciting workplace announcements. However, if you have a sensitive stomach, then all those workplace treats and meals might not make you feel so much like socializing—instead, you might feel like going straight to your bed! For people with digestive conditions, what they eat every minute of the day is particularly critical to maintaining their overall health. So how do you go about creating a workplace culture that’s focused on belly health for everyone? Well, the first thing to do is think about the type and variety of food that you offer at work. A basic sandwich and chips (refined carbs, high sodium, and low-nutrients), isn’t as healthy as a buffet that at least includes fruits and vegetables. 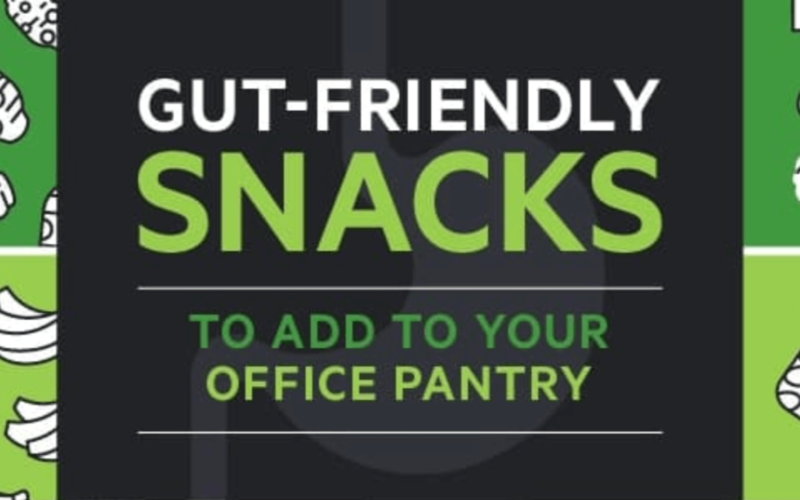 How else can you improve office food? This graphic has some ideas.